Who doesn’t love giant-size dinosaur skeletons in natural history museums? Moses Pendelton, founder and director of the contemporary dance company Momix, couldn’t help but wonder what it would be like to set one in motion. As a company that prefers to refer to its members as “dancer-illusionists,” Momix belongs to a specific field of contemporary dance that includes Alwin Nikolais, Pilobolus and even Cirque du Soleil. In fact, Pendleton left Pilobolus in the early 1980s, developing his own world-renowned company known for its ingenuity in combining acrobatic choreography with eye-catching effects, unique interplay of light and shadow and those unbelievable visual deceptions. For Momix’s newest production, Botanica, Pendelton conceived of a magical fantasy world he filled with energy, movement, a little smoke and mirrors and stunning puppetry created by The Lion King’s Michael Curry. 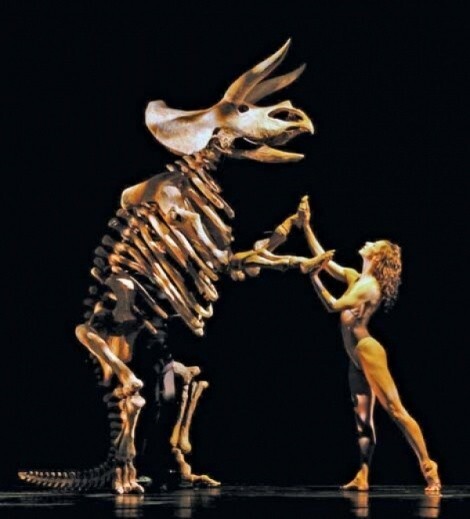 One of the most interesting parts of the production involves a sizeable, realistic-looking bony dino interacting with a female dancer who first rides the beast before being swallowed whole, an illusion that both entertains and mystifies. Being fully conscious of the fact that you are getting visually duped just adds to the amusement of experiencing Botanica. But perhaps the better trick comes when you forget you’re sitting in a theater seat, so that you can fully escape into the magical world filled with plants and animals unlike any you have ever seen.